Radiology is an essential tool for diagnosing many ailments and illnesses in your pet. X-rays are used to diagnose a variety of conditions, including broken bones, tumors, bladder stones and locating foreign bodies (a bone, toy or article of clothing) in your dog or cat's stomach or intestine. Radiographs also are useful for diagnosing heart and lung problems and can be used to evaluate cats and dogs for hip dysplasia and dogs for elbow dysplasia. 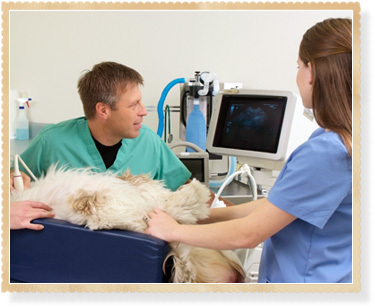 The Yancey Clinic of Veterinary Medicine uses the latest radiology equipment as part of your pet's diagnostic care. In more complicated cases, we utilize consultations with local veterinary radiology specialists, all in order to provide your pet with the best care and treatment possible. 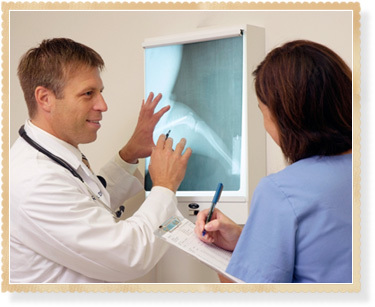 We can also send your pet's x-rays the Orthopedic Foundation for Animals for OFA certification. To provide your pet with the best care possible, The Yancey Clinic of Veterinary Medicine employs the latest veterinary diagnostic technology. Ultrasound is an advanced imaging technique that uses soundwaves to provide a real-time moving image of your pet's internal organs. This procedure is particularly useful for diagnosing abdominal and cardiac problems and can also be used to detect abdominal fluid, tumors, foreign bodies and other illnesses. An ultrasound machine is on site to guide many diagnostic procedures, including biopsies and urinary bladder evaluations (for bladder stones and tumors). Ultrasound is also helpful to diagnose pregnancy and visualize fetal heart rates. It is not uncommon for dogs and cats to suffer from either acute or chronic conditions within the nasal passages, which are generally referred to as rhinitis and sinusitis. Essentially, these conditions are inflammation and/or infections that on their own can be irritating and painful to your pet. If left untreated, they can lead to wider infections and more serious health issues. Since rhinitis and sinusitis can develop into serious conditions and may be caused by a range of issues—parasites, fungal infections, dental issues, foreign objects, etc.—it is important to bring your pet in for an examination. This examination will most likely include the use of a rhinoscope, which is a small camera that can be passed up and into the nose and sinus passages. The rhinoscope also includes tools that can be used to remove a foreign object or take a tissue sample for testing to determine the exact cause of your pet’s issue. Yancey Clinic of Veterinary Medicine is equipped with a rhinoscope and is up to date on the latest procedures. As with the nasal passages and sinuses, many dogs and cats are susceptible to a number of conditions that can affect the ears. These include infections, foreign objects, ear mites, and more. Though in there early stages they may not cause many problems, as they worsen they can be quite painful for your pet and can lead to more serious conditions. If you notice any of these symptoms or suspect that your cat or dog may be having an issue with his or her ears, we highly recommend bringing your pet in for a thorough ear examination. Visual inspection alone is generally not enough to perform a complete examination, which is why we will likely use an otoscope. This is a small camera that can be passed into the ear and ear canal to provide your veterinarian with a view of these structures. An otoscope also has tools to enable your veterinarian to retrieve a tissue sample or foreign object as well as to flush out your pets ears. Additionally, an otoscope allows your veterinarian to check the health of the ear drum, which provides important information as to the health of the middle ear. These mechanisms are responsible for hearing and balance. Because your pet cannot tell us what is wrong, we rely on laboratory diagnostic tests to aid us in determining your pet's condition. 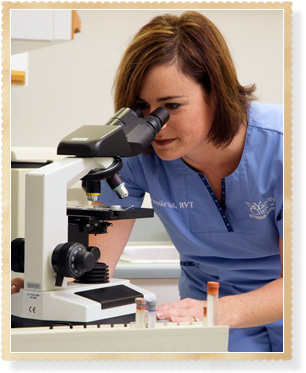 The Yancey Clinic of Veterinary Medicine is equipped with an advanced, in-house diagnostic laboratory capable of performing complete series of diagnostic tests. During an emergency, time is of the essence. Our laboratory is staffed by experienced veterinary technicians capable of performing complete blood counts (CBC), blood chemistry profiles, intestinal parasite evaluations, heartworm testing, and other tests, all within a matter of minutes. Your dog or cat's results are interpreted quickly and accurately, allowing us to begin your pet's treatment immediately. Because your pet deserves only the most comprehensive treatment, we also utilize the services of an outside reference laboratory when necessary.